Randomness, Thy Name is Abez | Abez sez Assalamualaikum! 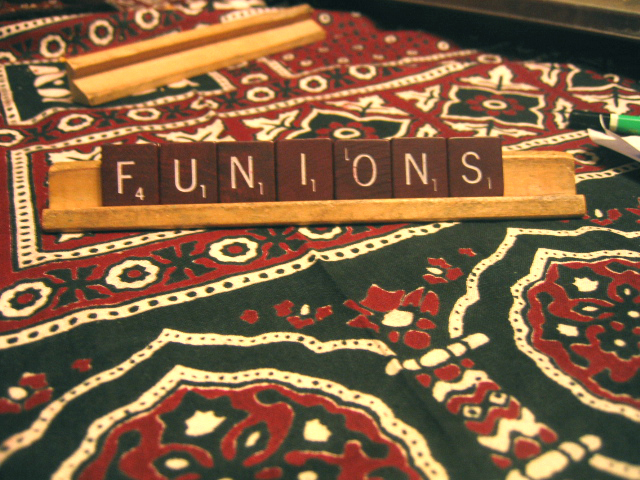 I don’t care what the Scrabble dictionary says, in my world, Funions is a perfectly valid seven-letter word. I should be able to put it on the board and get not only the 50-point bonus, but an additional 100 for the fact that Funions are so tasty. Btw, for those of your who didn’t spend their freshman year of high-school tasting everything in the nearby gas station, (except the gas, and the attendant) Funions are these puffy, round things that masquerade as onion rings. They don’t taste like onion rings as we know them, but they have an interesting flavor all of their own. Kheir. I was supposed to have gone to the tabib today, but for some reason my appointment wasn’t in the hospital computer. That’s the first time that’s ever happened, not that I minded, because half an hour before the supposed appointment, I realized I didn’t have a ride. The Silver Bullet #2 was off having fun with the parents who had forgotten that I needed it that afternoon. Which was quite alright with me. I’ll see the tabib on Saturday instead Insha’Allah. Ah yes, and I have to be productive now. Ramadan is almost 1/3 done and I don’t think I’ve done a good job of taking the benefit of this lovely month. So I made myself a chart and I have three things to do every day, Read Qur’an, Work Out and Do Sumtin Productive. These things are, of course, in addition to praying, doing my Arabic homework and pretending to be a contributing member of the family, he he, but yes, I think I need to do these three things especially. Otherwise I find that I 1.) don’t get much spiritual benefit, 2.) put on weight and 3.) get lazy because being hungry makes me sleepy. Wish me luck. I’m sleepy already. October 21, 2004 in Uncategorized. The Husbandfiles: I married a tech guy?